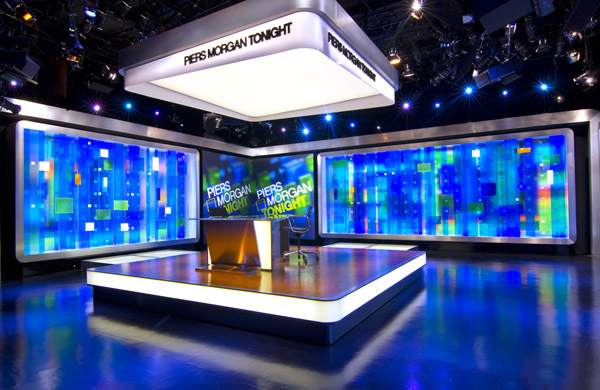 We speak with Jim Fenhagen, who has also created sets for The Colbert Report, The Daily Show, and ABC World News. Yes, folks, it’s kick-off week for Piers Morgan Tonight, CNN’s replacement for Larry King Live and the high-profile guests just keep coming: Oprah, Howard Stern, Condoleeza Rice. So, along with casting aside the aging broadcaster and his suspenders, the top dogs at CNN decreed a set remodeling for their new golden boy, and called in the King of All Set Design: Jim Fenhagen of brand experience agency Jack Morton. Fenhagen, whose New Jersey den is stuffed with 17 or 18 Emmys (“I’m embarrassed to say, I don’t know for sure,” he confessed), is the wizard behind sets for The Colbert Report, The Daily Show, CBS’s NFL Today, Martha Stewart, The Early Show, ABC’s World News Tonight, the Golf Channel, and MLB Network, as well as last fall’s “Rally for Sanity (and Fear)”. Fenhagen’s so good that even POTUS noticed (watch to minute 1:16). For Morgan’s debut, the show’s producers had one major request: “Everybody wanted it to be iconic, but not King-like” says Fenhagen, taking a break from installing the set for NBC’s Upfronts somewhere down on 36th and Broadway. The initial question, Fenhagen says, was primal: chairs or desk? The solution he devised is a sort of glass-topped non-desk, that allows light to shine through, and keeps the conversation intimate. Once that issue was resolved, Fenhagen turned to the major design challenge — -creating a setting for an interview show where 90% of the camera angles will be on the subjects’ faces. King’s set featured little dots. Fenhagen wanted something fresher, brighter, something that spoke to a more digital age. And he wanted it to be colorful. “Jonathan Wald (the show’s producer) and I are both big fans of classical modern design,” Fenhagen says. “We used to go over to the Lever House for lunch.” Wald mentioned a particular Mondrian that he liked, “Broadway Boogie Woogie,” that was inspired by jazz music and the energy of New York. Fenhagen started to play with that, adding dimension to the matrix of lines and colors, mixing white squares with a blue background. Along the way, he discovered if he put glass in front of an LED light, it turned the light into a Mondrian-like square. It was genius! He started building layers from that, placing color where he wanted it, integrating it with graphic animation. In the corner, he built two projection screens at right angles, where an image of the interviewee’s life can be displayed, or a broadcast of a remote feed can be projected. The result is a dazzling display of color, light, and subtle motion that animates the interview like a third guest. While it’s a perfect backdrop for high-energy guests like Stern and Oprah, it has the potential to be overwhelming for less galvanizing guests or more somber occasions. Fenhagen has built in a remedy for that. “You can turn it down,” he says, noting that it’s currently set at a high voltage 80%. But, he notes, that’s the producer’s job, not his. “Now that it’s up there, it’s their call,” he says.